Just yesterday I got the opportunity to ride the newest attraction at Universal Studios Orlando as they let guests experience Fast and Furious : Supercharged. Unfortunately it is a check list of complaints that many have cited in the past for Universal's dependency on screen based attractions. It is a Skull Island : Reign of Kong clone with less to offer. It's also rather short and the worst part, uninspired. There is simply nothing remarkable to speak about towards Supercharged. The queue is fine but has no stand out elements. The cars on display in the first room are really nice to look at and if cars are a passion of yours you will enjoy this but the overall tone is that of a warehouse and rather dull. It makes sense but it's still dull to look at. Lots of concrete walls and beige floors. On a very odd note, I did not feel any air-conditioning in the first warehouse room. Unsure if that will change as the weather heats up but it could be an issue for comfort in the summer months ahead. The first hosted pre-show area is the break room or the "family room" as Dom calls it. We are told this by Mia on a video wall as a Universal team member directs the crowd and interacts with Mia as much as the script allows. Ludacris's Tej was a factor in the first warehouse set up and he reappears here as well. In the overall, Tej is the most featured character and I definitely said "LUDA!" louder than intended every time I saw his face. I won't get to deep into the story of the ride but you are supposed to get on a party bus to go to a party to then party. Seriously, there is one word said on this attraction more than "family" and it's "party". The break room was not exciting to look at BUT it did display a sense of character that would have been greatly appreciated in the remainder of the attraction. There are lots of funny crew interactions posted on the wall as if members of the "family" come in and out leaving a slight burn for the next person to walk into. Most amusing was a pic of The Rock with the a word bubble above his head filled with an image of baby oil. Why this charm starts and ends in this room is beyond me. 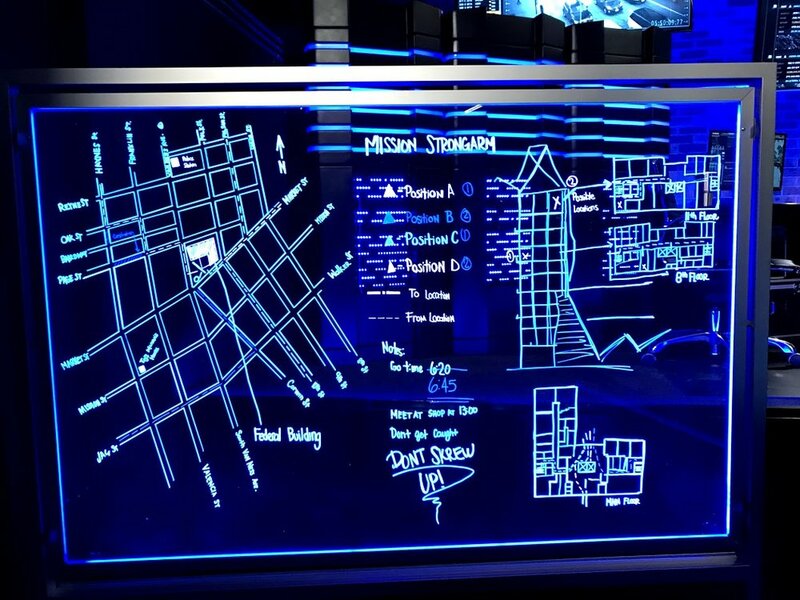 The "war room" is next and visually it has a lot of pop with numerous screens showing maps of the local area and seems to have the capability to launch a war. So yeah, the name works. After Luda pops up on another video screen he gets an incoming call from Dom. Vin Diesel appears here in only a still headshot but warns us that the FBI are about to raid the complex and that bad guy Shaw is on their tail as well. Following that a still headshot of The Rock's Hobbs appears and basically tells us the same info Dom just did with an added detail to stay off your cell phone so that Shaw cannot track you. This introduces a running theme of being constantly reminded to shut off your phone. It's a clever way of trying to get folks to not take pictures on the attraction. Maybe a bit overdone in the numreous reminders but pretty clever. After hearing the words "family" and "party" a few more times you are led to a short series of ramps in a concrete hallway that gets you to the loading station. The ride vehicle is Kong but with EDM music and neon lights flashing non stop. You load up and off you go into the first scene of the attraction. This takes place in what I can only describe as a dark path. There is almost nothing to look at. I do not know why it even exists. It's followed up by an ACTUAL set that looks fantastic. It has cars here and there as props and you are moving through an actual physical space. That matters. It adds a tactile piece that you cannot create with just screens. More of this please! Moving past that room we meet many characters from the film via screens. Some of them do not move naturally or seemingly at all. I could not help but notice that The Rock's chest and arms barely moved. This could be me remembering it incorrectly but something felt off. It is in this scene that the most memorable line is uttered as The Rock calls someone "Cookie Puss". Why does this matter? Well, back a few years ago when CM Punk was with the WWE he was at odds with good old Dwayne and Mr. Johnson called Punk a "Cookie Puss". It was silly and did not stick but there you have it. Cookie Puss returned. The final scene is the same 360 tunnel tech you see Skull Island : Reign of Kong. While I do not think Kong is a standard bearer by any means, at least I felt in the moment on that attraction. Seeing Kong battle dinosaurs was pretty cool and the swinging effect as you nearly went into the jaws of a T-Rex are thrilling if brief. This sequence though, the Supercharged sequence, is completely devoid of life or excitement. Everyone looks like a cartoon character and nothing is engaging. Yes, King Kong looked more realistic that anyone in this attraction. At one point Dom grabs onto a flying contraption that is trying to kill you. Grabbing onto it apparently makes it fly away. Sure. That does bother me. What does is I don't know if Vin Diesel is supposed to be grabbing onto a helicopter or a small drone armed with missiles but neither idea works. If it's a helicopter then he is actually twice the height of the helicopter which is hysterical and just looks like bad animation. If it's a drone then he is twice the size of it yet it's carrying him around with ease. It comes off as lazy either way. Nothing feels real. Nothing is engaging. There is a smoke effect that happens way too many times and it comes from the exact same spot of the bus each time. It's never surprising or thrilling. I did get splashed in the face with water a few times and I truly do not know why. I missed the reasoning. I am going to go with gasoline because why not. Then the whole thing just ends. Abruptly and with no real payoff. This was a bummer to me. While I hold no real passion for the F&F franchise, I do find the people in the films to be highly charismatic and the action sequences I have seen are over the top in a fun way. Supercharged misses all of that. It's over the top but in a cartoon way that never feels exciting. The actual attraction piece (minus the room with actual props) feels tossed together and the queue is nothing special. At least Fallon has that great virtual queue. Maybe I missed the virtual part? I used my Express Pass but it merged with the Virtual line. There was nothing half as interesting in this virtual queue as Fallon though. F&F is a massive franchise. Will anyone care about it in 10 years? Probably not but right now it's pretty popular. This could have been a blast of an attraction. It called for something more open than an enclosed bus. Something with a wider scope of vision. It called for new effects to be used in interesting ways. It called for more inspiration. It called for a Kong size animatronic of Vin Diesel's head yelling "FAMILY!" at me. It called for much much more. Not counting the incredible experiences offered at the Harry Potter themed lands in Universal Orlando, the recent additions have left much to be desired. Skull Island : Reign of Kong and Race Through New York Starring Jimmy Fallon have not exactly stoked excitement since their debut despite both attractions being based on popular subjects and sporting engaging queues. It's been the actual attraction part that failed to be memorable. Kong would place much higher on my personal scale than Fallon but the latter is something I have zero desire to revisit. I support Universal and I have high hopes for the horizon but they need to up their game on things not under the Potter banner.